Bonham Jewelry auction claimed three World Records! Bonhams’ Fine Jewelry Auction on December 5,claimed three world records. The sales included jewelry from renowned designers that includes Cartier and Van Cleef &Arpels, along with a pair of Kashmir sapphires that belonged to European princess. Many other gemstones like a fancy grayish blue ,2.97 carats step cut diamond, set in a ring designed by the society jeweler Andrew Grima were in the auction. The piece helped Grima creations to brag a new world record with an earning of £1.5m against its pre estimate sales of £500,000 to £700,000. 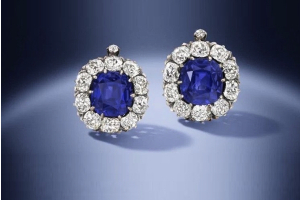 Another ostentatious property of an anonymous European princess, a pair of late 19th Century earrings set with two cushion-cut 7.92-carats and 7.96-carats Kashmir sapphires earned £1.5m against its pre-sale estimate of £500,000 to £800,000. Rubies from Burma and Madagascar also touched new records in earnings. A 10.28 carats Madagascan Ruby single stoned ring sold for £236,500, setting a new world record. The auction yield £6.79 m, with 88% of lots sold by value.